Lynch is the second QB under contract for Seattle in 2019 with last year's backup, Brett Hundley, set to be a free agent. In need of some quarterbacks to compete for a backup role behind Russell Wilson, the Seahawks on Thursday signed former Denver first-round pick Paxton Lynch — who was waived last September and not on a roster last season — to a one-year reserve/futures deal. And in the weird way that sports often works, Lynch was drafted by Denver with a pick the Broncos initially acquired from Seattle, the team with which he will now attempt to revive his career at the age of 24 (he turns 25 next month). Lynch was taken by the Broncos with the 26th pick of the 2016 draft, a selection the Broncos acquired from Seattle in a trade that then netted the Seahawks the 31st pick, which they used on right tackle Germain Ifedi. Seattle also acquired a third-round pick from Denver for moving down five spots, No. 94 overall, which the Seahawks used on tight end Nick Vannett in a trade that came in the offseason following Denver’s Super Bowl win as it was searching for successors for the retired Peyton Manning. The signing was listed on the NFL transactions for Thursday. Lynch, who played at Memphis, started four games for Denver in 2016 and 2017 — two in each season — with the Broncos going 1-3 in those starts. He also played in one other game, completing 79 of 128 passes for 792 yards with four touchdowns and four interceptions in his two years with Denver. He also ran 16 times for 55 yards and his mobility is viewed as making him a good fit for Seattle’s offense — the Seahawks had Lynch in for a workout last season. Seattle had only one other QB on its roster for the 2019 season — Wilson — with last year’s backup, Brett Hundley, now an unrestricted free agent and last year’s seventh-round pick, Alex McGough, signing earlier this week with Jacksonville. McGough spent last year on Seattle’s practice squad but did not re-sign with the Seahawks, apparently looking for a better opportunity to play, and his contract expired earlier this week and he became a free agent, eventually signing a deal with the Jaguars thought to pay him more than the Seahawks were offering as well as also returning to his home state and to a team with a more uncertain quarterback situations. Seattle acquired Hundley a few days before the regular season from Green Bay in exchange for a sixth-round pick, deciding it wanted a more proven player as a backup as the season neared. But Hundley, who started nine games for the Packers in 2017 when Aaron Rodgers was injured, did not play a down in 2018 as Wilson was the only NFL starter to take every snap for his team and it’s thought Hundley may be looking for a team where he will have a better opportunity to play, though it’s thought Seattle wants to re-sign Hundley if it can. Regardless of Hundley’s future, Seattle was going to sign another QB to compete for the backup role. Wilson’s durability means the Seahawks are never going to want to spend a lot for a backup if they can avoid it and they are likely hoping Lynch can show enough to be regarded as a dependable reserve if needed. The 6-7, 244-pound Lynch moved rapidly up the draft lists with a standout 2015 season at Memphis in which he threw 28 touchdowns while being intercepted just four times while also rushing for 239 yards (he rushed for 17 TDs in three seasons at Memphis). He was the third quarterback taken in the 2016 draft following Jared Goff and Carson Wentz, who went 1-2. 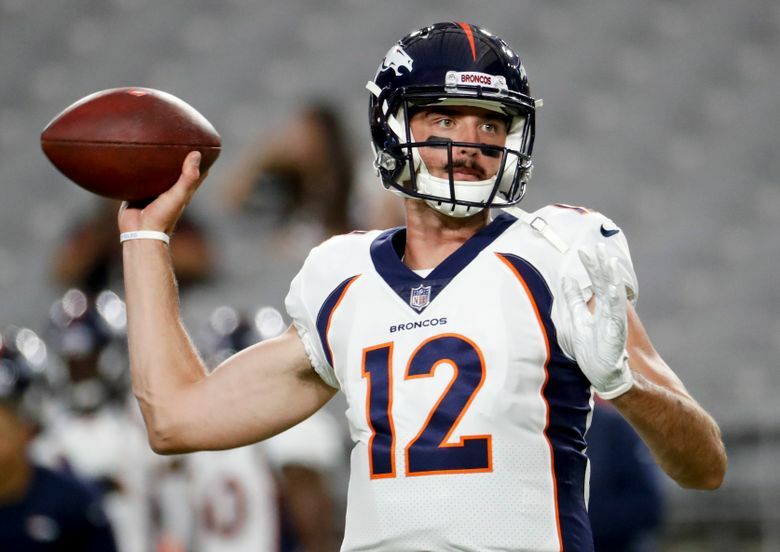 But after being unable to win the starting job (he lost out to Trevor Siemian for the starting job in 2016 and 2017) or show enough in the four starts he did get to merit a longer look, he was released on Sept. 3 and was not on a roster last season, regarded as among Denver’s biggest recent draft busts. Lynch had a base salary of $1.3 million last season as part of his rookie deal with Denver that paid him a guaranteed $8.3 million, one reason he was able to sit out a year ago— once he was not claimed on waivers he would not have signed a deal that would have paid more than that base. Lynch’s agent, Leigh Steinberg, explained that because Lynch had a guaranteed salary last season he could sit out and wait for the best opportunity to restart his career, which he decided was in Seattle. “He wanted to wait until finding a great fit,” Steinberg said. Steinberg said some of the things Lynch does well — throwing on the run, scrambling well for a tall quarterback and throwing deep — were not featured in Denver’s offense. “The opportunity to be mentored by Russell Wilson and coached by Pete Carroll factored heavily into the decision,” Steinberg said Thursday via email. #PaxtonLynch @PaxtonLynch has signed a one year contract with @Seahawks for 2019. @MemphisFB He wanted to wait until finding a great fit.